When Anita and I traveled in Vietnam, like other visitors to the country, we marveled at the chaotic city driving, an adrenalin-inducing swirl of motorbikes and people in a hurry. 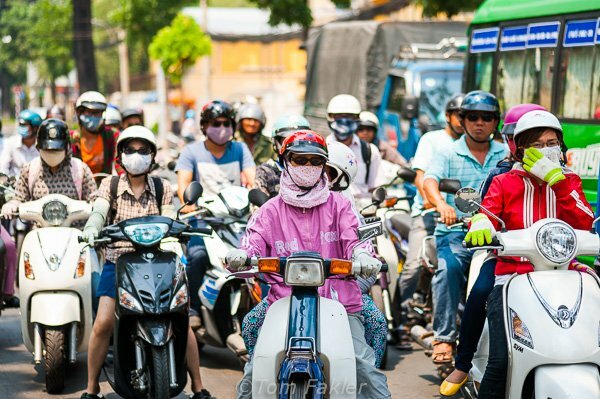 There are more than 87 million people in Vietnam, and it can seem that most of them are out on their motorbikes on the streets of Saigon and Hanoi on any given day. Many are women. From them, we learned about motorcycle fashion in Vietnam. This is a country for invention; most people ride motorcycles here and almost all of the women wear their hair long. 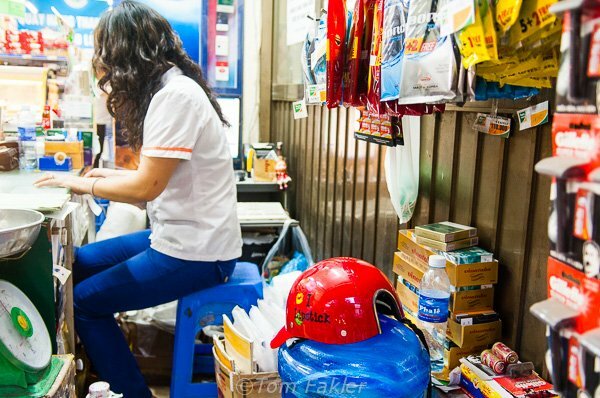 In Vietnam, helmets are required by law, but there do not appear to be any manufacturing safety standards. 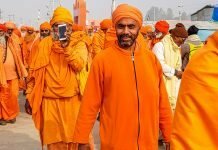 I would guess it is more comfortable to wear one of the helmets designed specifically for long hair, than a standard helmet. 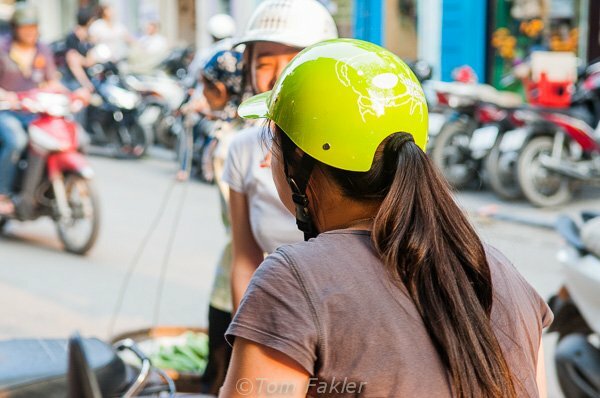 In Hanoi, we saw many women wearing what looks to be a very functional invention, the ponytail helmet. Have you ever seen one? Helmets are not only required by law but they are a standard part of one’s outfit. 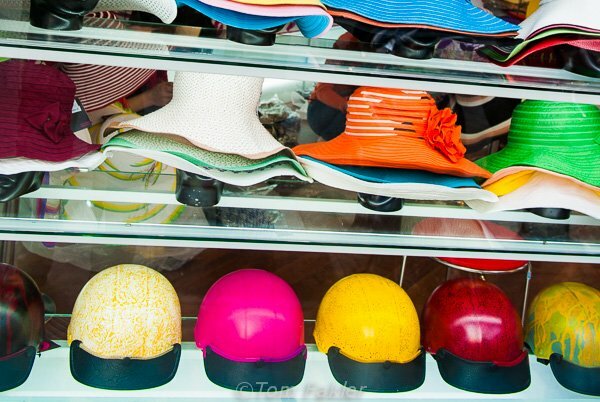 We spotted ponytail helmets–in a range of colors and patterns–for sale in a hat shop. 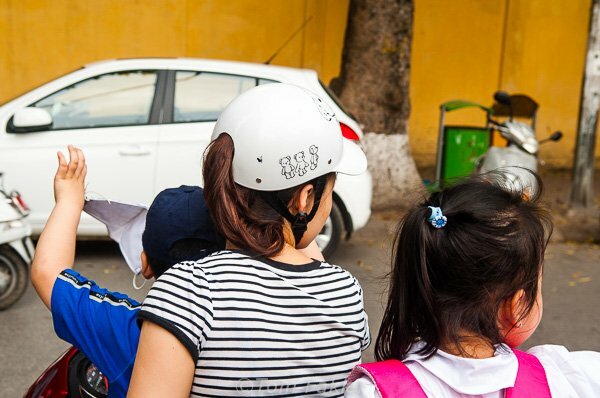 Ponytail helmets more than safety gear in Vietnam; they are your mark of style. Mother and kids commuting, with mom in a ponytail helmet. But what about the kids? 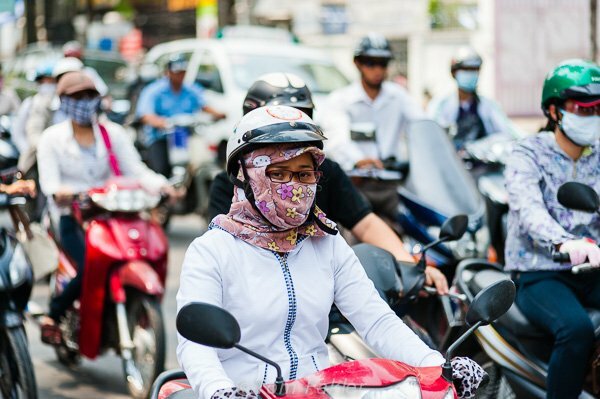 In Saigon, Anita and I noticed many of the people riding motos were wearing face masks; we assumed it was to filter out polluted air, even though the air seemed fine to us. We wondered why the masks worn by women are so large. Some continue down over the neckline onto the shoulders and chest. 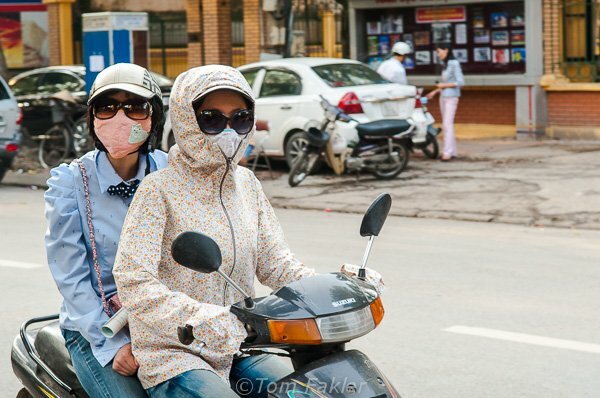 It seems that the art of the cover-up is key to motorcycle fashion in Vietnam. In Hanoi, we observed even more women wearing face masks than in Saigon. These were also for sale in roadside tourist shops. Some motorcyclists were wearing not only masks, but also helmets, huge sunglasses and gloves or lightweight windbreakers with arm extensions covering their hands. 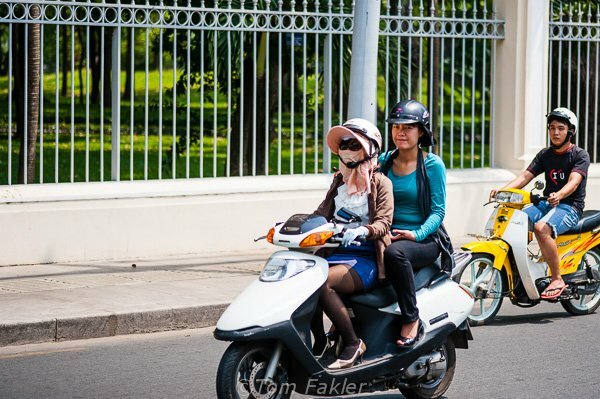 Like the helmets, fashionable cover-ups for women are widely available in the shops of both Saigon and Hanoi. The variety and styles of motorcycle cover-ups are endless, colorful and trendy. We asked a young man traveling on our tour to Halong Bay if he could explain all the cover-ups. He responded that women in Vietnam are serious about protecting their skin from the darkening effects of the sun. OK, that makes sense, and it explains the Vietnamese fashion innovations we saw. Our companion did not mention anything about cell phoning while driving in heavy traffic, but that is another topic! 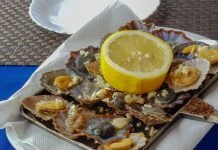 Previous articleModena, Italy—your next food adventure? Loved the article and pictures on Vietnam motorbike styles. I found the cover up quite interesting and the ponytail helmets a great idea considering that every women in Vietnam has long hair. 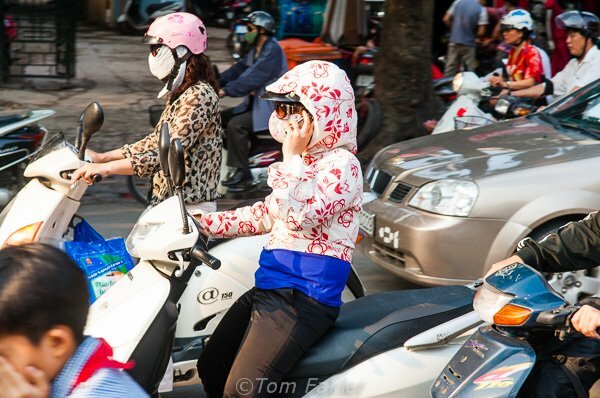 Hi Tom, Thanks for the wonderful photos, and both profound and humorous insights into motorcycle culture and fashion in Vietnam! Vietnam is great, motos everywhere.